If you are trying to keep things in your camp kitchen simple, a liberal sprinkle of salt and pepper may be all you need to bring out the flavors in grilled meats, but if you want to up the flavor ante a bit, please allow me to introduce you to our Tasty Trail Dust. 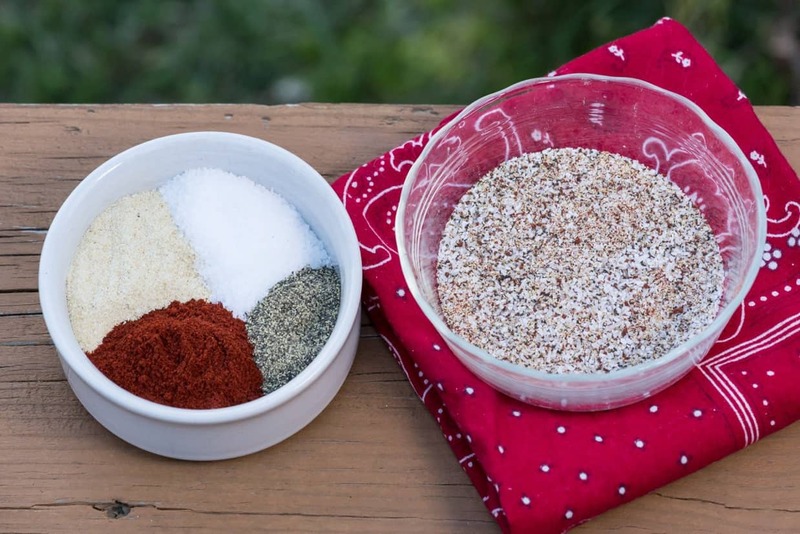 This savory all purpose seasoning is the go-to seasoning in our camping stash. It’s garlicky and smoky, and provides a kick of flavor to beef, pork, chicken, and even fish. I have been using these spices in combination with one another for a number of years. The flavor of this mix is so versatile. The recipe calls for granulated garlic. I prefer it to garlic powder because it mixes more uniformly with the rest of the ingredients. If you don’t like the flavor of smoked paprika, just leave it out. The salt, pepper and granulated garlic on their own with make a fabulous seasoning or rub. If you want a little extra kick, you could add a pinch or two of cayenne pepper to turn up the heat. This recipe makes about a 1/3 of a cup, which should last quite awhile. It doesn’t take much, only a teaspoon or two, depending on how much meat you are cooking, so take only what you need with you on your trip, keep the rest in an airtight container in the same place that you keep your other spices at home. This make-ahead all purpose seasoning provides a garlicky, smoky kick to beef, chicken, pork and fish.